The aim of this workshop is to have “hands-on” working groups and discussions on Data Analysis and Detector Technologies in DM search. It is aimed at PhD students, young researchers and experts in this field to exchange tools, know-how and get familiar with modern analyses and signals extracted from state-of-the-art detectors in DM search. 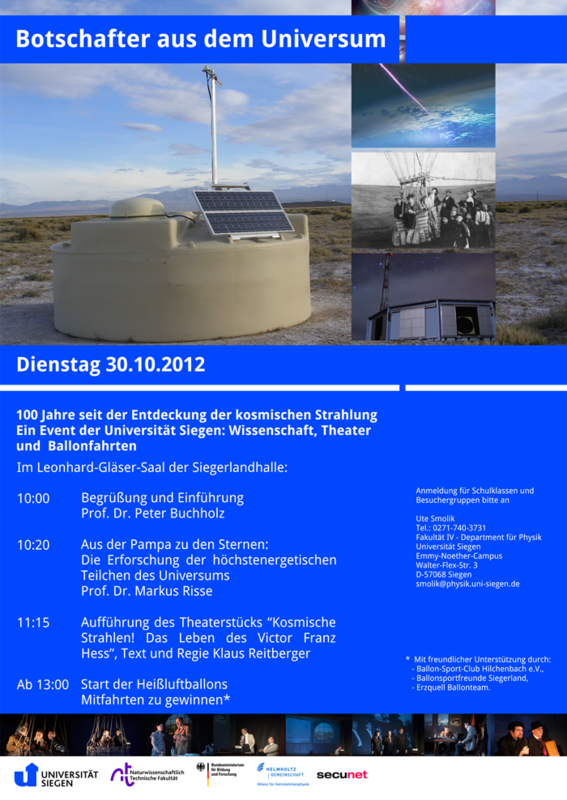 The workshop is sponsored by HAP and addresses colleagues within HAP, but it is also open for non-HAP members! Please forward this information to people who could be also interested by this workshop but are not members of these email distribution lists. Due to the operation of large ground based observatories and space-borne experiments sensitive to cosmic rays, gamma rays and cosmic neutrinos, astroparticle physics is entering a new and data-driven era. At the same time, there has been significant progress also in the theoretical and numerical modeling of sources and underlying physical processes. However, it has also become evident that high-sensitivity observations and experiments in concert with a rigorous treatment of backgrounds remain key for tackling yet-unsolved major questions like the nature of dark matter or the origin of the Cosmic Rays. This workshop aims to bring together theorists, experimentalists and observers to exchange views and ideas on the role of astronomical observations, surveys, source- and background modeling as well as numerical simulations for a multi-messenger view of the Cosmos. We envision both invited and contributed talks as well as an open discussion on the next steps ahead. 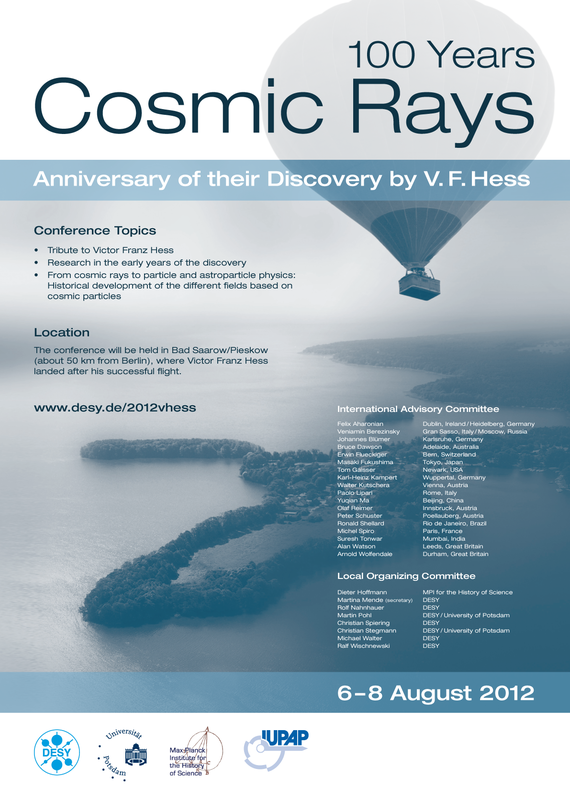 There will be a parallel session "Cosmology and Astroparticle physics" of this year's DESY Theory Workshop, taking place on September 25-28, 2012 at DESY, Hamburg. Traditionally, the parallel sessions are a forum for junior researchers (final stage PhD students and PostDocs) to share their results. 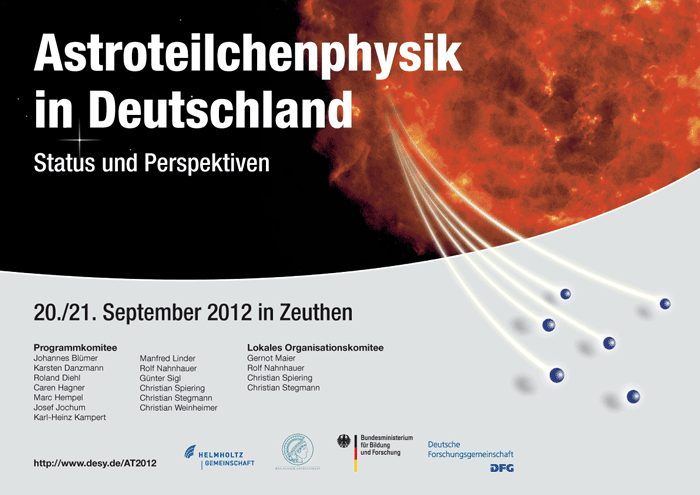 A code retreat is planed at DESY/Zeuthen on September, 12-13. The purpose of this code retreat is to discuss what numerical tools are used in simulating sources and propagation and to find synergies.